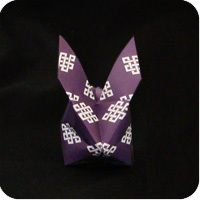 This Origami Blow-Up Bunny is the similar to the Balloon Bunny. Both start with the waterbomb base and both are cute! 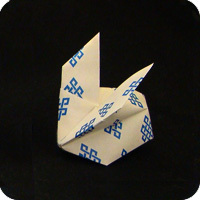 As its name implies, this model requires that you blow into a hole so it inflates into a 3 dimensional paper bunny. Start with a square sheet of paper with the colored-side facing up. 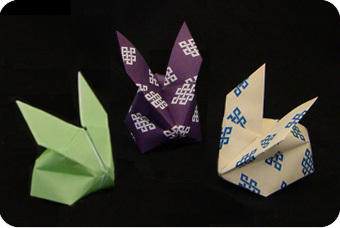 Fold and unfold the paper in half both directions (top to bottom; then left to right). 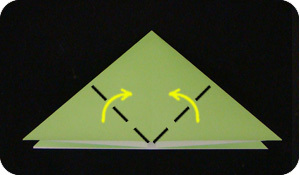 Fold and unfold the paper along the two diagonals to get an X-shaped crease. 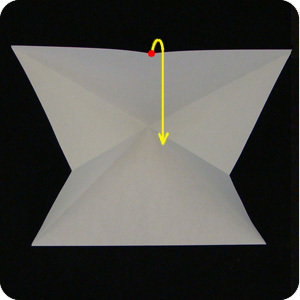 Collapse the paper into a waterbomb base. 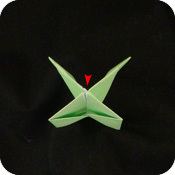 To do this, fold the top-edge of the paper towards the bottom-edge. At the same time, bring together the left and right edges. 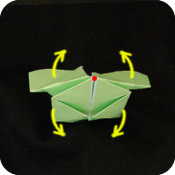 When done, this sequence of folds is called a “waterbomb base”. 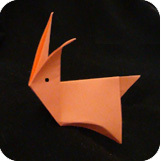 It is an intermediate-form which is commonly used in the making of many different origami models. 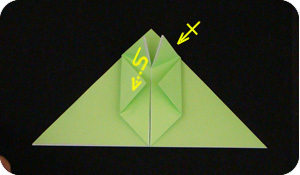 Fold the two bottom corners to the top of the model. You will have a diamond-shape on top of a triangle-shape. 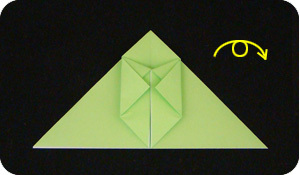 Fold the left and right corners of the diamond towards the center of the model. At the top of the model, you will find a loose flap. 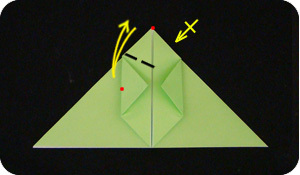 Fold the flap down so the edges align with the right-edge of the model (join red dots). Unfold. Repeat on the right side. Refold the flap and tuck in the loose end of the model into the small pocket made in step 5. Repeat on the right side. 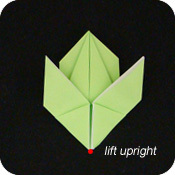 Fold down the bottom-left and bottom-right corners of the paper. 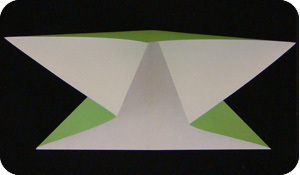 The left-edge and right-edge of the model should meet in the middle. 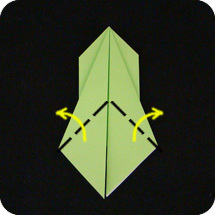 Fold the flaps back up and out towards the side. 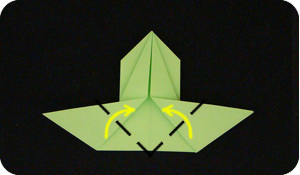 Fold the flaps back in towards the middle of the model. 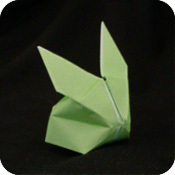 This makes the ears of the rabbit. Rotate the model upright so the red dot is pointing up. 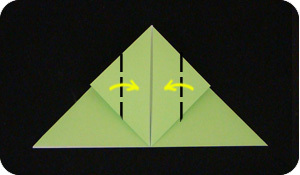 Flare open the 4 flaps so they are spread away from one another. The model is more 3 dimensional and less flat. Put the model to your lips and blow air into the small hole (red arrow). 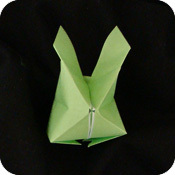 The model will inflate and become the rabbit’s body.